If you hear the call of the seven seas, then chances are you might fancy a boat yourself. Unfortunately, to own a boat would definitely cost you a fair amount of money, and even more so if you are talking about a luxury yacht. 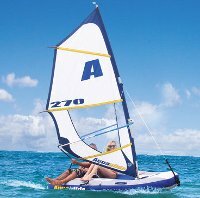 Good thing there are always alternatives around, and we are talking about the $799.95 Inflatable Windsurfer And Sailboat. This particular inflatable watercraft will be able to convert from a windsurfer to a sailboat, where it sports an 11.5′-tall aluminum mast that will offer adequate support for its 33′ sq. PVC sail. A trio of fiberglass battens will ensure it remains taut during gusts for consistent powered gliding. There is also an integrated boom that delivers deft steering of the sail by hand when it is used as a windsurfer, where it is capable of catching the wind easily (and outrun the Black Pearl that is commandeered by the legendary Captain Jack Sparrow, perhaps? ), ensuring you continue to maintain a sturdy foothold on the hull. The foot pump that came with the Inflatable Windsurfer And Sailboat will let you inflate its PVC hull in a mere 10 minutes, and the whole thing can be stowed away in under 10 minutes.